This entry was posted on July 17, 2018 by Texas Safety Supply. 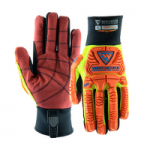 Westchester Oilfield Impact Gloves from Westchester Safety Group has introduced a line of Oilfield Impact Gloves. 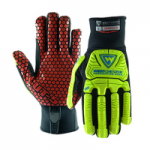 The Westchester 87000 Rig Runner Impact Glove, the Westchester 87010 Rig Ace Impact Gloves, the Westchester 87020 Rig Cat Impact Gloves and finally the Westchester 87030 Rig Cat with Oil resistance and Cut Resistance. Texas Safety Supply is a leading supplier of Oil field gloves in bulk as we are a responsive same day shipper from across the United States at Excellent prices. Texas Safety Supply carries Joker Impact Gloves, Jester Impact Gloves, Ringers Impact gloves, Portwest Impact Gloves, Ansell Impact Gloves along with several additional to quality Oil Field Impact Gloves. The Westchester 87000 Rig Runner Oil Field Impact Glove is designed to protect the hand from bumps and bruises with it's fully coated TPR back of the hand. The Palm of these oil field impact gloves is a synthetic leather with PVC dots for improved grip in slippery, oily conditions. The back of the hand is HI viz Green for easy compliance checks. The fabric on the back of the hand of these oil and gas gloves is a stretch spandex material that conforms to the hand helping with dexterity and improved usage. The Westchester 87010 Rig Ace Impact Glove is designed as an Oil resistant impact glove. The silicone palm of these oil resistant impact gloves repels liquids and ensures a grip even when coated with substances. The silicone palm allows the user to stay productive even in oily conditions. These oil resistant impact gloves are an excellent glove for oil and gas gloves when an oil resistant glove is required. The Westchester 87020 Rig Cat Impact Glove with Cut Resistance is designed for use when cut protection is needed in your purchase or buy impact gloves decision making process. The Westchester 87020 has a revolutionary palm that is made from a combination of synthetic leather and PVC. The 87020 Impact glove is durable and will hold up under tough usage while working as Oil rig gloves. The cut resistant impact gloves provide cut level 2 protection to the hand. The thumb sabble is reinforced with Kevlar thread to prevent cuts and extend the wear of the glove when other gloves will break down. The Westchester 87030 Rig Cat Cut Resistant and Oil resistant impact glove is the top of the line impact glove from Westchester. This top notch glove is both a cut resistant impact glove and a Oil resistant impact glove. Similar oil and cut resistant impact gloves are normally priced in the mid forties dollar range. A Cut resistant impact glove with Cut Protection at Level 4. The palm of these oil resistant impact gloves is silicone and a honeycomb pattern that both repels liquids and channels them away.